Culture and education are interlinked. This entry examines the cultural factors that shape the development of formal education systems for the Murle minority group of Greater Pibor in South Sudan. It also identifies non-cultural factors that have affected the development of formal education systems and analyzes the relationship between them. The entry is structured in four sections. First, it introduces the context of the Greater Pibor and the Murle minority group in South Sudan. It also provides definitions of culture and education and discusses their relationship. The next section identifies specific cultural aspects of Murle society and analyzes their impact on formal education. After that, the entry presents recommendations for the work of scholars and educational stakeholders such as government officers, and concludes with implications for development of formal education. This entry intends to help teachers and education specialistsunderstand non-school factors that shape the development of formal education systems, embedded in the context of Greater Pibor society. The Republic of South Sudan is the world’s newest nation; it gained its independence in 2011 after claiming about 98.8% vote in a referendum in favor of political autonomy from Sudan (Christopher, 2011; Curless, 2011). The Murle are the Eastern Nilotic people who are believed to have migrated from Ethiopia and settled in the eastern part of what is now South Sudan (Arensen, 1964). Sudan’s 5thPopulation and Housing Census of 2008 estimated the population of Greater Pibor as 214,676 people (SSCCSE, 2008). They are one of 64 ethnic groups in South Sudan, originally inhabitingthe Greater Pibor Administrative Area (Turton, 1979). According to the National Baseline Household Survey conducted in 2009, about 144 out of 214,676 Murle were literate, a proportion lower than any other group in South Sudan. 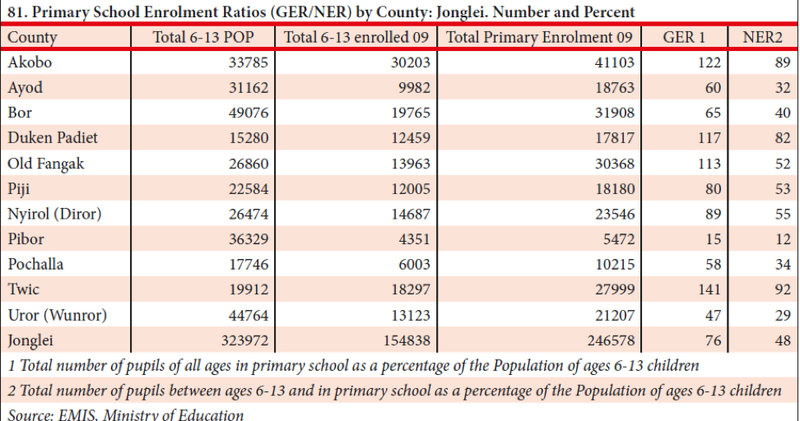 Similarly, Greater Pibor in Jonglei region has the least primary school Gross Enrolment Ratio (GER) of 5,472, which is just 15% (see Figure 1). This situation raisesconcernas to the underlying factors of such low literacy and enrolment numbers. The cultural context of Murle societycan be one possible factor. Figure 1. Gross Enrolment Ratio for Counties in Jonglei Region(Southern Sudan Centre for Census, Statistics and Evaluation (SSCCSE), 2009, p. 69). Formal education, like other forms of development, can only take roots in a society that supports its values, norms, beliefs and structures. Rigid cultural practices and beliefs, such as those of the Murle people as discussed below, make investment in formal education slow. Culture and education are interdependent as society’s educational systems are shaped by its cultural beliefs and values and, in a similar manner, cultural patterns are guided by its educational systems. Many comparative education researchers focus on school-based inputs to analyze educational development across countries. Yet, culture is one of the most influential non-school factors that influences learning. To demonstrate this connection, we first look at the definitions and meanings of culture and education. Tylor defined culture as a ‘complex whole which includes’ ‘knowledge, beliefs, arts, morals, law, customs, and any other capabilities and habits, acquired by humans as members of society’ (as cited by Thomas, 2007). The current globalization of education is arguedby some countries and minority groups to potentially have a negative impact on their education through its political, economic, and cultural colonization of education (Bakhtiari and Shajar, 2006). Formal education is defined by Claudio (as cited in Dib, 1988) as a systematic, organized education model, which can be structured and administered according to a given set of laws and norms, presenting a rather rigid curriculum as regards objectives, content, and methodology (p. 300-315). In most cases, local language is used as the medium of instruction in formal schools. The relationship between culture and formal education is that they both are structured in a way guided by a set of laws and norms that must be compatible to support oneanother’s development. In the Greater Pibor area, livestock is the main source of livelihood and has increasingly made its way to urban markets that have expanded beyond local economies (Leff andLeBrun, 2014). The Murle in Piborengage primarily in pastoralism, moving with their cattle between more established settlements and more temporary ones, depending on the season (Maxwellet al., 2014). Regular migrations remain an important aspect in this traditional livelihood production system, especially during the dry season when cattle are taken to distant places for months, in search of pastures and water. In most instances such movements attract conflicts over grazing lands, water sources, and cattle raiding, which are deadly, and creates a circle of violence with neighboring communities. Such practices (livestock keeping) are demanding and create mobile communities which hardly settle. It further deprives nomadic children of the opportunity for formal schooling. These children and youth devote most of their time looking after cattle instead of being in school. In addition to constant migration, the establishment of permanent schools becomes difficult, because they are likely to be left unused when seasonschange. School attendance in pastoralist communities remains low, as entire generations are being raised without education (Beswick, 2001). This cultural belief of sticking to traditional sources of livelihood creates a gap that makes it a challenge to keep pace with formal schooling system in the Greater Pibor area. Child abduction (kidnapping children and women) is another unique cultural practice by the Murle people (Leff andLeBrun, 2014). Abductee(s) are usually adopted to become members of abductors’ community. The article titled 14 Abducted Children Rescued in Jonglei State’(Thon, 2009) discusses the abduction and reunification of 14 children from Jonglei and the detention of the abductors in Pibor town awaiting trial. This practice of child abduction is carried out by Murle youth, with their neighboring communities the Jie, Kachipo, Anyuak, Dinka, Nuer, and Toposa, and now has expanded to other countries like Ethiopia and Northern Kenya. Recent trends of internal child abductions among the Murle created mistrust among members of the community. Some of them now do not allow their children to go to school even if schools exist within their community. In some areas when a raid or abduction happens, parents or community leaders ask the school to suspend learning activities for a certain period, paralyzing the routine operation of classes. Sometimes youth organize parties to chase after abductors to recover their children or cattle. Such activities often end up in violent clashes due to revenge. This culture of abduction has resulted in a vicious cycle of violence that has led to the slow development of formal education in the Greater Pibor Administrative Area (Yoshida, 2013). The Murle society does not have a formal hierarchical leadership structure, but is broken into generational age-sets, with each set comprising of a ten-year span (Leff andLeBrun, 2014). As the members build a family and acquire livestock, their roles within the age-set may change. A new age-set forms about once in every ten years, and they rise and fall in prominence depending on its strength and their abilities to raid. These generations have internal governing systems and symbols of identity (Leff andLeBrun, 2014). For example, the type and pigment of beads, body markings and hair styles of each group clearly describe the generation style. To-date, there are up to nine different generations, with the older called ‘Moden’ and the younger ‘Lango’, although there is an emerging younger generation called the ‘Tangot’. Power transition from one age-set to another is never peaceful. The younger generation has to fight their way through to take responsibility from their predecessors. Such fierce and fatal generation fights have resulted in fractures, injuries, and deaths. Communal bonds make it difficult to break the vicious cycle of illiteracy, because one member cannot be in school if his or her age-set is involved in a cultural group activity, hence derailing the participation of the Murle in formal school settings. Another aspect of the Murle culture is the value attached to dowry or bride price paid in the form of cattle during traditional marriages. In many parts of South Sudan, girls are often regarded as an opportunity to increase family wealth, as marriage brings in resources such as cattle or money. About 40% of girls between ages 15-19 are married, with some as young as 12 years old (Girls Education Strategy South Sudan, 2012). With pastoralist tribes typically partaking in the bride price practice, girls also serve as a form of family wealth, in which the sooner the girl marries, the sooner the family acquires her monetary ‘value’ in cattle (Beswick, 2001). This matters because formal education is governed by a set of cultural rules and laws that guide its operation in communities. These cultural lags of discrimination against one gender create inequalities as married girls cannot participate in formal education. The South Sudan General Education Act 2012 set forth a framework for development of policies and programs that promote accelerated learning especially for communities affected by the civil war (1955 – 2005). This gave rise to the development of the Alternative Education System policy in 2014, with six major strategies to condense 8 years of primary school to 4 years for overgrown children (GESP, 2012). Based on the above, I suggest the following remedies to the situation in the Greater Pibor area described above. First, effective implementation of the Alternative Education System policy and the Girls’ Education South Sudan program by the government and development partners would curb the widening illiteracy gap among the Murle people. The Alternative Education System is an accelerated program designed to cover educational lag of communities affected by conflicts. This program has 6 main strategies aimed at improving enrolment through establishment of accelerated learning programs, community girls’ schools, pastoralist education programs, basic adult literacy programs, and intensive English courses for teachers. Second, civic education is vital in the communities to sensitize parents so that they can see the importance of formal education and allow their children to participate in learning. This does not only change the perceptions of education by parents, but enables them to see the value of learning for their children’s future. Community engagements through meetings, forums, and dialogues can mobilize the Murle for development of sustainable and lifelong learning programs. Third, there should be investment in construction of infrastructure, especially schools, teachers training colleges, and vocational institutions. The Government of South Sudan with development partners should invest in infrastructural projects, especially constructions of roads for the Murle people to access business and learning opportunities within South Sudan and beyond. Fourth, Murle livelihood programs should be diversified to include mixed farming methods. The government should encourage market-oriented production to improve local economies, and encourage stable settlements within farms and reduce seasonal migrations. Cultures are not static, but change with time depending on the level of interaction of a specific community with the outside world. Education in this case plays an important role in shaping the attitudes and perceptions of the Murle people to view their community using a global lens and learning from other communities. Specific aspects of their culture, such as the informal leadership structure, child abduction, traditional cattle grazing,and the value attached to bride price may not be the only reasons that account for the low development of formal education in the Greater Pibor Area, but they contribute greatly to the lag. Education stakeholders and government officials need to further investigate educational imbalances and make recommendations and interventions that aim at addressing the ‘cultural lags’ delaying the implementation of education for sustainable development for the Murle people. Arensen, J. (1964). The History of Murle Migration: Research Paper on Cultural Anthropology (D.Phil. ), Oxford University Professor of Anthropology, Houghton College. Bakhtiari, S. & Shajar, H. (2006). Globalization and Education Challenges and Opportunities. International Business and Economics Research Journal, 5(2), 95-101. Beswick, S. (2001). "We are Bought Like Clothes": The War Over Polygyny and Levirate Marriage in South Sudan. Northeast African Studies, 8(2), 35-61. Christopher, A. J. (2011). Secession and South Sudan: An African Precedent for the Future? South African Geographical Journal Suid-Afrikaanse Geografiese Tydskrif, 93(2), 125-132. Curless, G. (2011). Sudan’s 2011 Referendum on Southern Secession. Ethnopolitics, 7, 1-25. Dib, C. Z. (1988). Formal, Non‐formal and Informal Education: Concepts/applicability.Paper presented at the AIP conference proceedings. Girls Education Strategy South Sudan (2012). Ministry of Education and Instructions, Directorate of planning.Government of South Sudan. Leff, J. & LeBrun, E. (2014). Following the Thread: Arms and Ammunition Tracing in Sudan and South Sudan. Graduate Institute of International and Development Studies. Maxwell, D., Santschi, M., Gordon, R., Dau, P., & Moro, L. (2014). Researching Livelihoods and Services Affectedby Conflict.Overseas Development Institute. Southern Sudan Center for Census, Statistics and Evaluation (SSCCSE). (2008). Sudan 5thPopulation and Housing Census Results, 2008.Government of Southern Sudan. Thomas, J. (2007). The Trouble with Material Culture. Journal of Iberian Archaeology, 9(10), 11-23. Thon, P.A (2009); 14 Abducted Children Rescued in Jonglei State.Sudan Tribune Plural News and Views on Sudan(September 2012, Bor). Turton, D. (1979). A Journey Made Them: Territorial Segmentation and Ethnic Identity among the Mursi. Segmentary Lineage Systems Reconsidered. Queen’s University Papers in Social Anthropology, 4, 119-143. Yoshida, Y. (2013). Interethnic Conflict in Jonglei State, South Sudan: Emerging Ethnic Hatred between the Lou Nuer and the Murle. African Journal on Conflict Resolution, 13(2), 39-57. MEd, The University of Hong Kong.